We’ve been using the market like a casino. Except, “this casino is on steroids” according to billionaire investor Carl Icahn. Icahn thinks the stock market is getting dangerous for the average person. His reasoning? Over-leveraged ETFs (exchange traded funds). This past week, that danger manifested, with the DOW dropping 1000+ points on Monday and then again on Thursday. Sometimes, you sense something is coming. But in 2018, just about every major sign that the stock market will correct itself is pointing towards it. Retailers, car companies, even movie theaters are suffering. Sears will be closing 100 more stores than it originally thought (bringing the total to 350). Macy’s will be closing stores and letting more employees go because of poor holiday sales (only 1.1% gain over 2016). When it comes to cars, almost every major car company is feeling the pain. Total car sales are down 1.8% compared to last year, and are 1.4% less than 2015. As for movie theaters, they’re seeing lower ticket sales than 1995, falling 3.6%. And that’s with Star Wars: The Last Jedi on the big screens. He followed the soft warning with an even more direct one… that investors should expect at least one correction of the global stock market this year. A good number of market analysts are pessimistic, saying the “end is near” and the market is in the late part of the cycle, just before a crash. Even Warren Buffett’s investing “predictors” are starting to sound an alarm (measuring Wilshire 5000 market cap in proportion to U.S. GDP). Basically, when the stock market is higher than the economy, be wary. Right before the “dot com” bust, it was ~145% higher. Before the 2008 disaster, it was close to 110% higher. As of late last year, the “Buffett Predictor” was at 134%. Not a good sign. Icahn finished his warning about Wall Street selling ETFs to willing investors by saying he thinks that one day the market will implode. One day, this thing is just going to implode because you have too much leverage with too many people buying these (ETF) things and Wall Street sells them these products. And I’ve been saying for a long time, it is extremely dangerous. This implosion is Carl Icahn referring to, coupled with the fact the market is long overdue for a major correction, are good signs the “earthquake” is near. These investors are also concerned that the Federal Reserve might raise rates, thus making it more expensive for companies to borrow and invest money. Higher inflation, higher wage growth, and less corporate investment would mean smaller profits for corporations. When the larger investing companies start to pay less to own shares because of their clout, the market tends to follow suit. CAPE values currently sit at levels that only existed before the Great Depression of 1929, and the “dot-com bomb” of 2000. Higher CAPE values typically mean the market is likely to decline. But in this case, the historic nature of these values might mean the “Big One” could already be starting. Keep in mind, the CAPE measure of stock overvaluation wasn’t even this high before the 2007 subprime mortgage crisis that initiated our last major crash. During this time economists have noticed an interesting trend: all those past recessions, except for one in 1960, were preceded by an increase in the price of oil. So if this all pans out as expected, the upcoming correction could be much worse than 2008. As Warren Buffett said, “be fearful when others are greedy.” Let other people think the market is invincible while you prepare yourself instead. 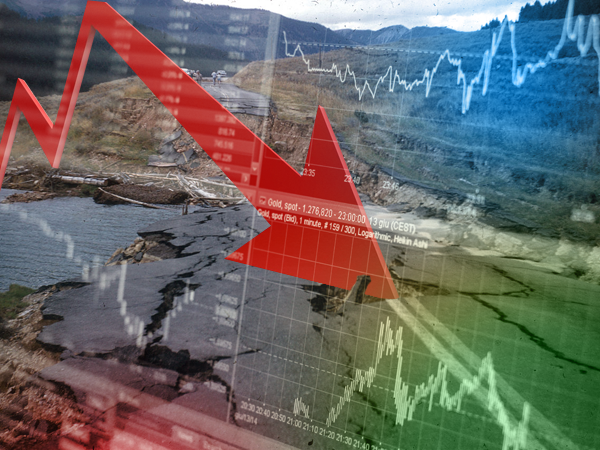 With so many signs pointing towards a stock market “quake,” protecting your wealth is key.